Bharatiya Janata Party (BJP) president Amit Shah on Wednesday said that Mizoram has lots of possibilities in hydro power and tourism sector. Amit Shah stated this on his Twitter handle after addressing a huge gathering at Aizawl, the State capital of Mizoram, where the saffron party chief announced that the party would field candidates in all the 40 seats in the forthcoming State Assembly elections scheduled to be held on November 28, 2018 . 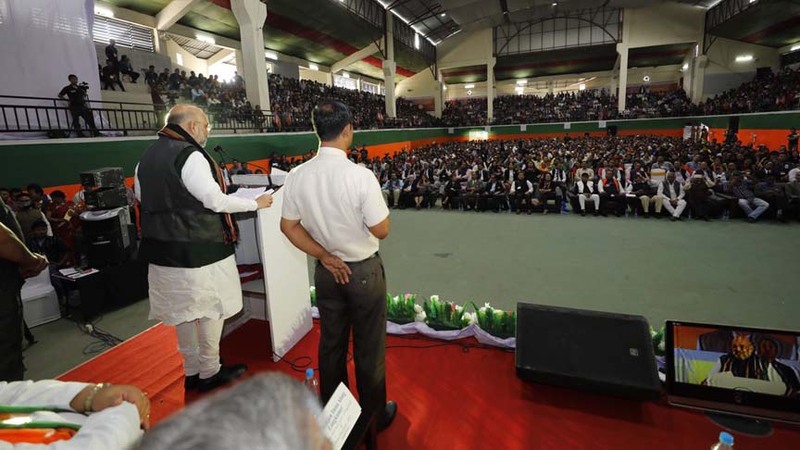 While stating about Mizoram’s potentials for development in the hydro power and tourism sectors, Amit Shah alleged that the Congress Government in Mizoram led by Lal Thanhawla has failed in ‘all fronts’. Terming the Congress Government in Mizoram, which has ruled the State for the last 10 years under the leadership of Lal Thanhawla, as ‘inefficient’ the BJP chief alleged that corruption in the Government has led to the “closure of 3 existing Public Sector Undertakings” (PSUs) in the State.